I had high hopes of recording all the hoopla surrounding Lucy's big birthday over the weekend in this post. Instead, as I was looking through all the pictures I took over the weekend there was one that just spoke to me. May not look like a whole lot, right? But to me this one little picture records so much. First of all, we are in a tent. And if you could see outside you would see trees surrounding us nestled hugging close to a beautiful orange cliff. 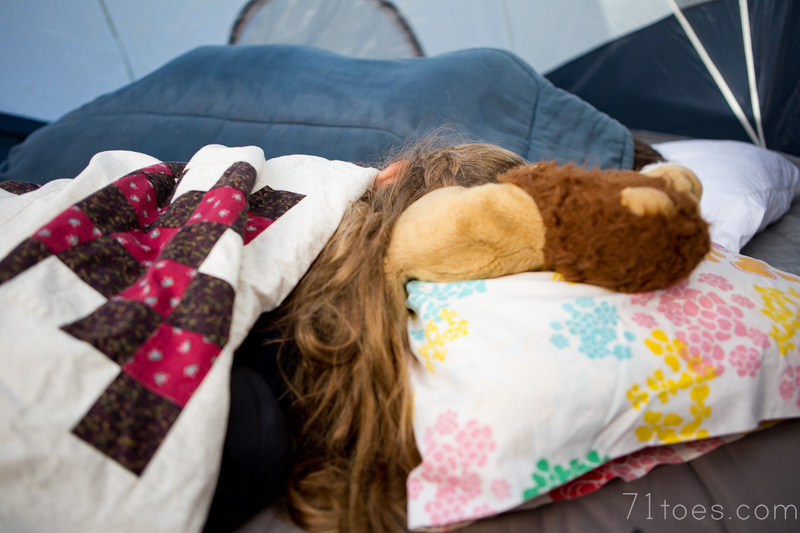 I want to remember how it felt to creep into the tent after she was asleep and hear that freshly-turned-ten-year-old of mine breathing next to me. For some reason it was the most beautiful sound that night amidst the crickets and under the stars. I like that you can see a little bit of her braid from when Grace did her hair just how she wanted it that morning. I love that you can see Grace beyond her who sweetly switched spots with Claire in the middle of the night since her mat was so uncomfortable...and that everyone was so snuggled up (it was cold!). I love that Leo the lion is right there where he's supposed to be...she cannot sleep without that guy. I love that it shows part of the blanket we shared in the middle of the night since she woke up cold. I love that you can see her flat pillow that she prefers over any other pillow and makes sure she takes with us any time we don't sleep at home. The mat you can see under that pillow makes me laugh because we had a funny mat story that we will laugh about that trip for a long time. I wish pictures could smell (sometimes) because this one would smell like campfire which would remind us all that that campfire provided us with some great tinfoil dinners Dave whipped up and also some pretty delicious s'mores. So much more to say...the not-so-dreamy stuff too, because of course it was there as well. But for today, I just want to bask in the little memory this one picture holds, and the story it tells.